I’m a driver. This is not to say, as most of my friends and work colleagues will likely attest, that I am a driven person. It is also not to say, as those same folks will agree, that I always know where I am going. I like to drive. The fact that I frequently get slightly lost doesn’t particularly bother me. This is a good thing, considering I now live in a city where to do just about anything requires driving (or public transit, but that’s another story). It’s also a big city. Sprawling, in fact, with roads that go on forever, a quirk of Toronto’s design that I consider a particular gift. It’s not just Young Street, which, in its mythological proportion stretches for more than 1,800 kilometres (1,000 miles). I always thought Young Street was the longest street in the world, but apparently there is some debate about this, as part of the road goes by the name of Highway 11 and you have to dance a few jigs and reels to keep travelling it. I might try a Young Street road trip someday, just like journalist James Bow who, after driving the whole route and documenting it in photos and text, determined that Young Street proper covers a paltry distance of 58 km. Were I to follow it as it becomes Highway 11, I would, undoubtedly, get lost. It’s the jigs and reels that do me in. I cannot for the life of me figure out my easterly and westerly points unless I have some significant marker (say Lake Ontario or the CN Tower) as my orientation. 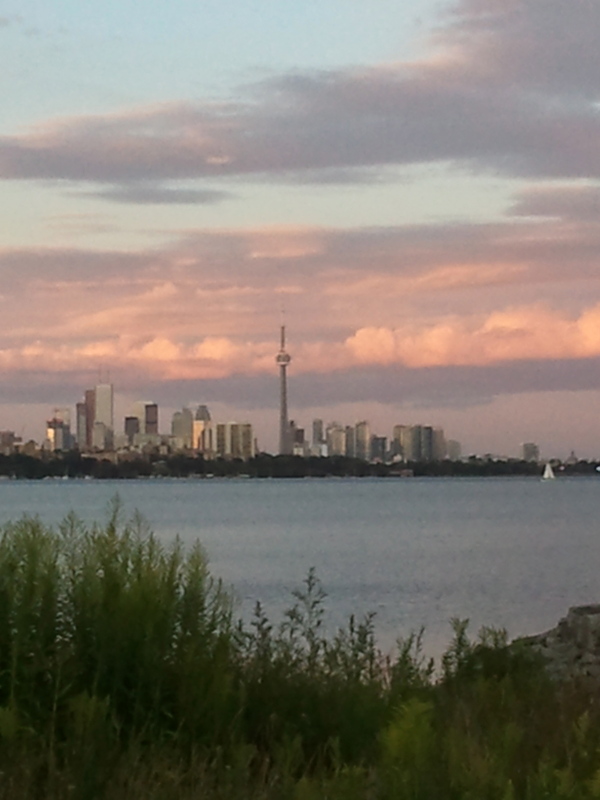 Lake Ontario and the CN Towers are fast becoming touchpoints for me. When I can’t figure out where the lake lies in relation to where I am, I will go in circles until I find a familiar street. Now, the nice thing about Toronto is that many of its streets are becoming familiar to me for the same reason that Young Street has achieved its fame. They are long. Bloor, Dundas, Eglington, Lakeshore…these streets go on forever, dissected into east and west sections by the infamous Young Street (which, if you’ve never been to Toronto, runs south to north as nearly as I can tell, except for those jigs and reels somewhere along its rural journey). I have fallen in love with Bloor, Dundas, Eglington and Lakeshore. I rather like Royal York, Islington and Kipling, too, for, these are the streets that, like Young, take me from one pole to the other. Eventually, most streets in Toronto cross each other, which is quite helpful to a regularly lost soul like me. This week is a case in point. On Monday I left the city for my first solo road trip north to Muskoka. I researched my directions, which clearly told me to go east on the hated 401 until I needed to go north. Alas, when I ventured onto the freeway, I quickly realized I was heading west, not east. And it was 5 p.m., which is to say traffic was at its worse. And that’s no small statement in Toronto. There is no easy way to get off the particular stretch of highway I was on, so it took me 20 minutes to finally exit the sprawling eight-lane road. Then I found myself in an unfamiliar part of Mississauga, which meant nothing to me, until, travelling far enough, I found my way onto Eglington. This was a gift, for, as I’ve mentioned, Eglington stretches east to west. I rerouted myself and headed east on the 401, then north to Muskoka where everything was fine until I had to come back to the city on Wednesday. Once again, I was stymied by the east/west dilemma. Coming south on the 401, I had all of five seconds to decide if I should follow the 401 east into Toronto or head west. I made, as I will always do when driving, the wrong choice (this is why I am not a gambling woman). Once again, I quickly realized my mistake, got off the highway, and knowing that I was at least south of the 401, tried to find a familiar street that would take me back to my neighbourhood (which, ironically, is what is considered west Toronto, but still east of the point of the 401 that left me bewildered in the first place, and kept me bewildered longer than necessary). I meandered through several neighbourhoods until, joy of joys, I stumbled upon Eglington, which I’ve taken to thinking of as my favourite, a sort of patron street of lost drivers. I followed it west until I found a suitable southerly connector and, happily, could once again see Lake Ontario, assuring me, I’d found my way home. Lynda MacGibbon is a transplanted Maritimer living in Toronto. Her column appears on Friday in the Moncton Times & Transcript. Contact her by email at lmacgibbon@gmail.com and follow her on Twitter @lyndamacgibbon. So happy to have shared one of your adventures! Haha…I bet you were visualizing it all as you read! Ha! I’d love to have been along for the ride. I’m thinking of a Family Circle cartoon. May I assume that you must have tracked your jig and reel progress on your GPS? Otherwise, I can’t imagine would could have remembered all the twists and turns!